3D Russian Volume Eyelash Extensions (also known as "3d Lashes") are taking the industry by storm. Originating out of Russia, this new technique gives client's safe, yet stunning volume, and is the largest innovation to the lash world! 3D lashing has only been in North America since the summer of 2013, and is being adapted by top lash salons all over North America. 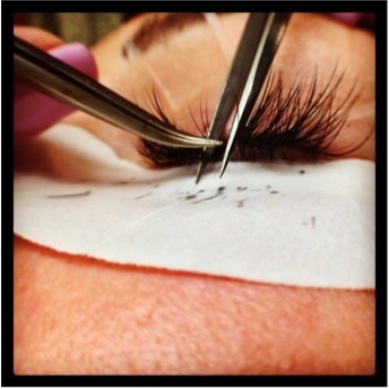 For years, we were limited by the number of natural eyelashes our clients had. If they had 100 lashes per eye -- they would get 100 extensions. This is what we were taught was safe, and doing other-wise would compromise natural lash health. These were the days technicians were also using thicker diameter extensions and we have come a LONG way since then! All of these options weigh LESS than one traditional lash extension! Not only does 3D Volume lashing mean fuller lash extensions, but also the extensions that are applied (usually 200+ lashes per eye with volume) are also easier to maintain for our clients through breakthrough weight distribution of the lash bases, and added flexibility of thinner diameter extensions.